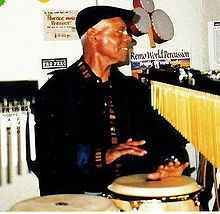 Latin Jazz Percussionist (born ca. May 30, 1924 in Havana, Cuba, died april 14, 2014 in San Francisco). Armando Peraza is one of a handful of Cuban percussionists who came to the United States in the 1940s and 50s. Other notable congueros who came to the U.S. during that time include Mongo Santamaria, Chano Pozo, Francisco Aguabella, Julito Collazo, Carlos Vidal Bolado and Modetso Duran. He died of pneumonia on April 14, 2014 at the age of 89. Sonny Payne, Mel Lewis, Benny Barth, Armando Peraza, Ray Mosca With Freddie Gambrell, The Mastersounds, Zoot Sims, Russ Freeman Sonny Payne, Mel Lewis, Benny Barth, Armando Peraza, Ray Mosca With Freddie Gambrell, The Mastersounds, Zoot Sims, Russ Freeman - More Drums On Fire!